I recently received some temporary tattoos specifically designed for nail art from Fake Tattoos based in Sweden. These little tattoos are exactly like the ones you would remember wearing as a kid, and the process for applying them is exactly the same. You just choose the design you want to apply, cut it out, remove the protective film on the front and press it to a dry nail. Then hold a damp cotton ball or tissue to the backing paper for about 30 seconds and the paper will slip off. I actually found the range of designs on the tattoos a little quirky and odd, certainly not your usual flowers and swirling designs that you normally see. 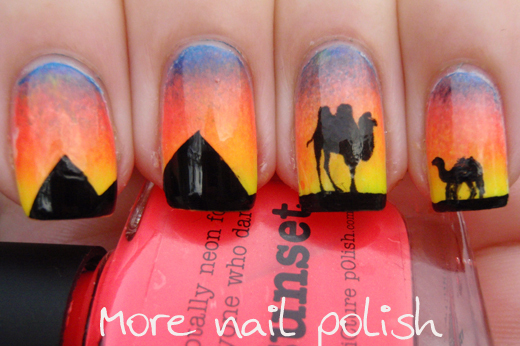 Case and point, for this mani, I chose the large camel tattoo from the Arty Design set. I created a gradient using Picture Polish Bombshell, Sunset and Citrus - which was such a gorgeous gradient just on it's own. I then taped off the irregular chevrons for the silhouetted Pyramids. I could have done these as regular chevrons, but to me, the design needed more perspective, so I created them different sizes and slightly overlapping. I placed the camel tattoo on my ring finger, and attempted a free hand little camel off in the distance on my pinky. You can clearly see the different in fine detail that the fake tattoo provides. I've done a few nail art designs using some of the other fake tattoo designs which I will show over the next few days. This looks amazing! 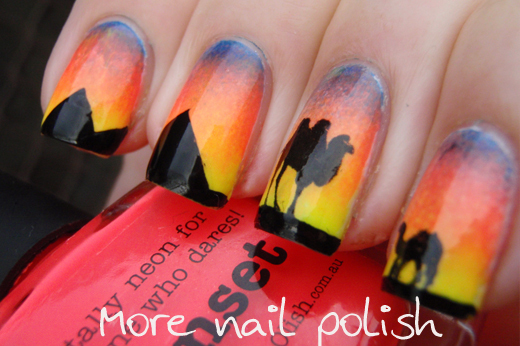 I always enjoy your nail art, you're a very creative person! These look fantastic! 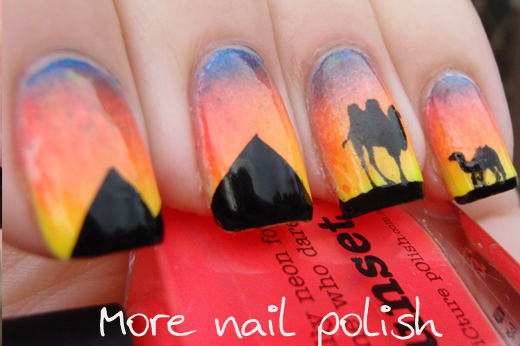 Im glad you decided to go with the gradient desert scene! It looks fabulous!! These are beautiful. Makes me want to get on an airplane.